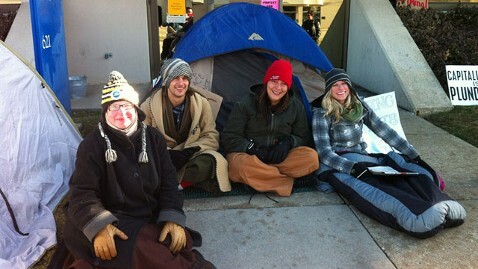 DES MOINES, Iowa - A small group of protesters camped out overnight in front of President Obama's re-election headquarters here, demanding to speak with someone in the president's campaign office and air their concerns and vowing to stay planted in front of the office through the harsh Iowa winter. There were about 10 protesters this morning sitting outside two tents surrounded by mostly anti-war and anti-capitalism signs, including one plastered on the front door of the Organizing for America office that read "Obama's Former Headquarters." Jessica Reznicek, a member of Occupy Des Moines who also spent time in New York City's Zuccotti Park as an Occupy Wall Street protestor, said they have "two demands" that they want met by the president. "We ask that number one they cut the U.S. military budget in half and number two he dismantle the U.S. military empire," Reznicek told ABC News. "When we arrived yesterday the business was shut down and nobody was in there and we made a vow to occupy until our demands were addressed, so here we stand." She also runs the Occupy Des Moines off-shoot Occupy the Caucuses and said they have big plans for the week leading up to the Iowa caucuses, although she did say, "We have absolutely no plans of disrupting the grassroots caucusing process" on the night of Jan. 3. However, they are going to be active and Reznicek has been reaching out to Occupy groups all over the country. She said she expects between 500 to 700 people will be here that week with many of them traveling to Des Moines, but added there could be more. She said she has been in touch with Occupy groups in New York, Chicago, Wisconsin, Kansas, Omaha, and Minneapolis. According to Reznicek, on Dec. 26, Occupy protesters from all over the country will arrive in Des Moines. The following day they will be trained in "acts of non-violent civil disobedience." Different groups will also form that day and protesters will decide which of the presidential candidates, including Obama, they want to "target with their grievances." The groups will then take that list of grievances to all the campaign headquarters on Dec. 28, 29, and 30, and protest or "occupy" them "until those demands are met." Joseph Glazebrook, an attorney for several of the protesters, said that although he was an Obama supporter last cycle, they chose to camp out at the president's re-election headquarters instead of one of the GOP candidates because "if we only focus on one part of the problem we are never going to change anything. We have to focus on the whole problem, which includes the president. " Reznicek also said she caucused for Obama last time, but said the group is not affiliated with either political party. Occupy Des Moines protested last month at Herman Cain's headquarters when he was still in the race, and at a Mitt Romney adviser's office before Romney's campaign opened a headquarters. They also protested a Chris Christie event at Romney headquarters here, interrupting the New Jersey governor when he was stumping for the former Massachusetts governor earlier this month.